John Nicks, a member of the World Figure Skating Hall of Fame (class of 1993), is among the renowned coaches and skaters in the sport. Nicks was a successful skater, winning Britain’s only World Pairs Championship in 1953 with his sister Jenny. He has coached many top U.S. pairs teams including Jo Jo Starbuck and Ken Shelley, Tai Babilonia and Randy Gardner and Jenny Meno and Todd Sand. He also coached Peggy Fleming. 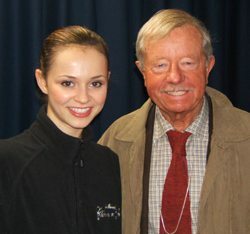 It was Nicks who saw a talented young girl and developed Sasha Cohen into one of the world’s most prominent skaters. They teamed up again in December, 2004 after Sasha trained for a couple of years in the Northeast. Nicks was multi-talented in sports as a youth, first starring as a track athlete. But it was skating where Nicks would make his mark on the world of sports. Nicks’ athletic career was detoured while he served for his country’s National Service from 1948-50 as a private in the Royal Sussex and later the Royal Middlesex regiments. He served in Hong Kong. Afterwards Nicks and his sister would rise through the ranks to become world class pairs skaters. They turned professional in July, 1953 and won many national and international championships. Nicks settled in Los Angeles in 1961 and has become one of the world’s top coaches. British Champions — 1947. 1948. 1949. 1950. March 1952. December 1952.